Has your home’s old siding seen better days? Is it dull, dreary, and an overall drag to your curb appeal? 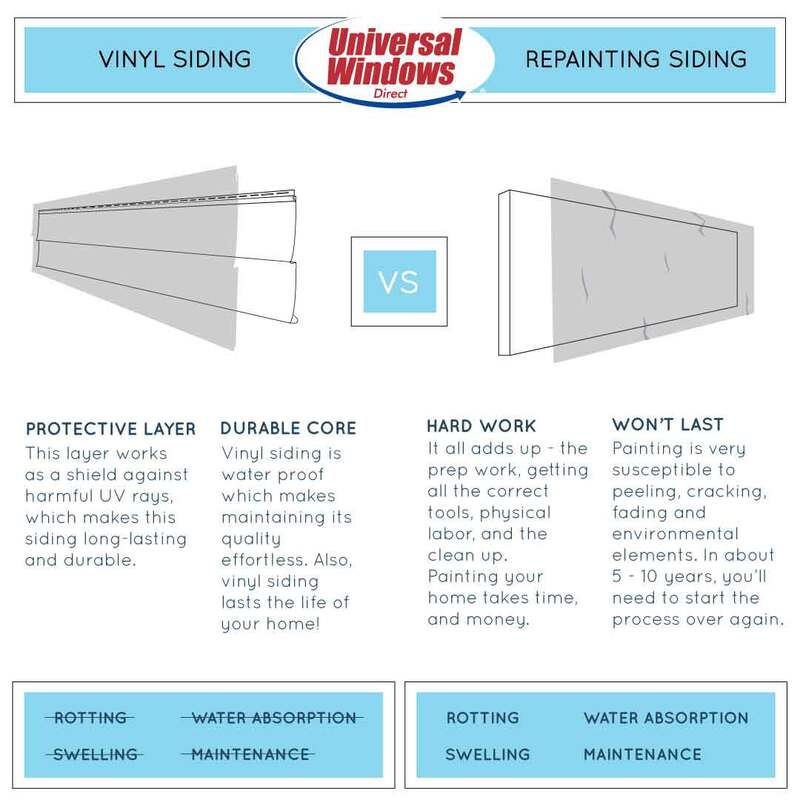 Two of the most popular options for upgrading exterior siding are: painting over existing aluminum or wood siding, or complete siding replacement. If you’re on the fence, wondering if you should replace your siding or re-paint it, we’ve compiled these must-read tips for every homeowner. Don’t make any decisions about the exterior of your home without reading this first! Paint is a great application. It can really transform the look and feel of your home, so it’s no wonder that you’re considering painting your old siding! However, it’s no secret that painting old siding is a major undertaking, not to mention incredibly physical and very costly. If you’re painting a 2,000 sq. foot home, expect to spend some time (and money) on getting the job done. But painting old siding has its advantages as well. Let’s discuss both the positive and negative consequences of this approach. Let’s start with the obvious—savings. Painting is one of the most popular ways to give many aspects of your home new life without spending a great deal of money. If you are worried about going way over budget with vinyl siding replacement, paint is the cheapest option. But keep in mind that cheap now means paying later. This form of payment comes in sacrificing lasting beauty, overall maintenance and energy efficiency. How much does it cost to paint old wood or aluminum siding? Prices vary quite a bit. One of the primary factors comes down to the area where you live. However, Angie’s List estimates that the cost of painting old siding is between $99 and $242 per 300 square feet. When you compare this to the cost of vinyl siding replacement, it can be as much as 60% less to paint your siding. If you decide to paint your home’s old siding yourself, you’ll save on the cost of paying someone else to do it. Even if you decide to pay someone, it’s still cheaper to paint your old siding rather than replace it. How Much Does It Cost to Paint Old Siding? When you replace your siding, you’re often limited to what’s available in the company’s inventory---although sometimes custom upgrades are available. With paint, color customization allows you to pick from a wider range of color combinations, giving you the opportunity to custom match any color. You don’t have to worry about what’s in stock or receiving the exact hue of your choice. Pro tip: Your paint color must be no darker than that of your current shade. Going too dark can actually damage the siding, causing it to collapse and buckle from additional heat absorption. So, you know the benefits of painting your old siding. Sounds great, right? Before you head to out to buy your supplies, you might want to consider some of the cons of painting. They say time is money, and this is no exception! If you’re bravely taking the DIY approach, you can expect to spend a large amount of time getting the exterior to look up to par. Let’s say that you’re planning to paint a 2,000 sq. foot home. You can’t simply pick up the paint brush and get down to business. There is cleaning and prep work involved before you make the first stroke with your paint brush. First, you’ll need to thoroughly wash the exterior. Any dirt and grime left behind on the old siding will make a mess of your new paint job, not to mention making paint rollers and paint brushes dirty! How do you wash old siding? Your first thought might be to power wash the siding to remove any mold or grime, but that won’t get all of the dirt off and a ton of water is used on the existing siding. To prepare properly, you’ll need to hand wash every square inch of your siding, then thoroughly rinse it. Time spent: 1-2 days. Next, you’ll need to prime the siding. Priming is necessary if your old siding is porous or pitted. Time spent: 1 day. Then you’ll need to paint the siding using a hand paint brush and paint roller. The paint must go on smooth and even or you’ll risk making the exterior look even worse than when you started. Time spent: 1-2 days. Remember that if the siding is not properly prepared and clean, the paint will peel away and undo all of your hard work. Before you skip to the hardware store and buy a few cans of paint, know that you can’t apply just any paint to the old wood or aluminum siding. Why? First, you need to consider the fact that exterior siding is exposed to the elements 24 hours a day, 365 days per year. The need for exterior paint is obvious, but there are other factors that can impact your new paint job. The next consideration is the fact that old siding expands and contracts due to heat and cold. The wrong type of paint can lead to cracks in the siding, which will completely ruin the look of your new paint job. You’ll also need to think about the weather when painting. According to Bob Vila, you should avoid hot, humid, or windy weather while you paint. Some paint manufacturers recommend not painting in specific temperatures. For example, Benjamin Moore’s exterior siding paint recommends avoiding temperatures cooler than 40 degrees F.
Paint in the shade if possible so the paint doesn’t dry too quickly. Buy high-quality painting tools that won’t leave unsightly streaks, including at least two synthetic bristle brushes for applying latex paint. Don’t paint over dirty siding. Check for mold or mildew growth as you go. Don’t paint over siding that’s deteriorating. Being prepared is key to ensuring that you paint your exterior like a pro! There may be a clause that voids your warranty if you decide to paint over your existing siding. In fact, some warranties are even voided if you power wash your siding. This small detail can lead to a lot of headaches down the road, so go through your current warranty with a fine tooth comb or call the manufacturer if you’re not sure. Lastly, painting is only a short-term solution for increasing curb appeal. In about 5 - 10 years, you’ll need to start the process over again and apply more paint. But by then, your siding may have reached the end of its life and require total replacement. Shopping for New Home Siding? Get the Most for You Money! 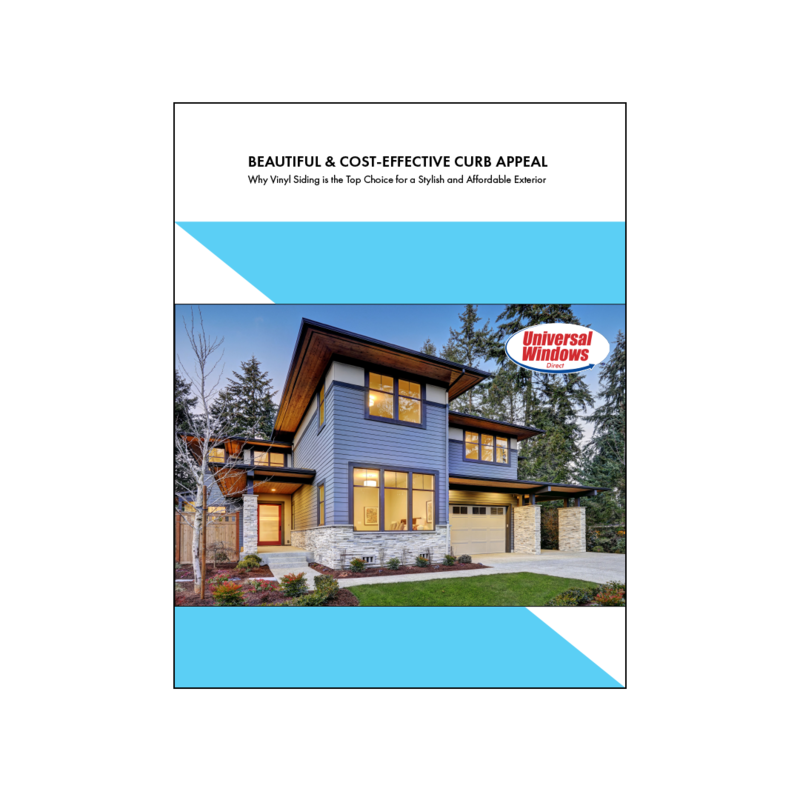 Get the inside scope on buying the best value in replacement siding with our free guide. Now that you know the ins and outs of painting old siding, it’s time to talk about siding replacement! Here is the good and bad about installing new vinyl siding on your home. Replacing your exterior is serious business that can take a bite out of your bank account. Many materials cost a significant amount of money that might make you wonder if siding replacement is even worth it! With vinyl siding replacement, you truly get an affordable option that doesn’t bust your budget. While keeping in mind that not all vinyl siding is of equal quality, the best vinyl siding provides value year after year! The key is to find siding companies that offer quality vinyl siding at affordable prices---and we think we know one! There’s never a need to paint your vinyl siding. The best siding replacement uses a color process that coats every square inch of the paneling in top-quality paint. This paint won’t fade away from the sun’s rays, which is a common concern for areas of the exterior that are exposed to direct sunlight. How do you know that you’re getting the best quality exterior paint possible? Look for vinyl siding companies that offer a warranty to guarantee vibrancy of the paint for a specific amount of time. However, keep in mind that low maintenance doesn’t necessarily mean zero maintenance. Over time, atmospheric dirt can collect on the siding. Sometimes hard rain will splash mud onto the side of your home as well. This is true for any type of exterior material. Mix your own cleaning solution of 70% water and 30% vinegar. You can also mix ⅓ cup laundry detergent, ⅔ cup powdered household cleaner, one quart of laundry detergent bleach and one gallon of water. Oxygen bleach won’t damage your landscaping. Use a soft cloth of a long-handled bristle to scrub the siding, similar to the type of brush that you’d use to clean a car. Wash textured vinyl siding with a brush to clean out the grooves. Start from the bottom of your siding and work your way up. Rinse the solution as you go and before it has an opportunity to dry. Be very careful if you decide to power wash the siding. Read the directions and check with what your manufacturer recommends for cleaning. Brand new vinyl siding is so beautiful that it almost radiates elegance! Not to mention, its craftsmanship and attention to detail is striking, which leads us to our next pro! Vinyl siding panels are beautiful to look at and possess the look and feel of authentic wood exterior. But when you choose vinyl siding replacement over painting it, you can add more charm to your exterior by way of vinyl scallops and vinyl cedar shakes. Paint can be beautiful, but it’s one-dimensional. With the addition of scallops and cedar shakes, it adds unmistakable character and an instant boost in quality to your curb appeal. Best of all, you can enjoy this charm and versatility for decades. Unlike painting old siding that only provides results for roughly 5-10 years, you can expect new vinyl siding installation to last a lot longer. High-quality vinyl siding can last 25 years or longer while always looking beautiful! Why choose paint that lasts a decade or less when you can double (or more) the longevity with a new vinyl exterior? When you buy a can of paint, you get just that---a can of paint! But with vinyl siding replacement, you can check a whole lot more off your list! By replacing the old stuff, you’ll have the opportunity to add an underlayment, which further increases your insulation value and energy savings. When was the last time a gallon of paint lowered your monthly electric or gas bill? Replacement vinyl siding also gives you the opportunity to add details like shakes or scallops, which can enhance the exterior and add a luxurious touch. New siding takes just a few days to install and requires absolutely none of your time or energy. Plus, with pros on the ladder and you safely on the ground, there’s no risk of injury. The only real con to replacing your old siding versus painting is cost. While replacement siding is more expensive than painting, the look of a quality exterior is priceless and your new vinyl siding will provide aesthetic appeal for decades to come. What is the cost of vinyl siding? It varies by brand and market, but these are some numbers that you can use as a benchmark. Even though vinyl siding installation will cost you more than a paint job, it’s important to remember the return on investment. In fact, the national average for return on investment is 76.7%.